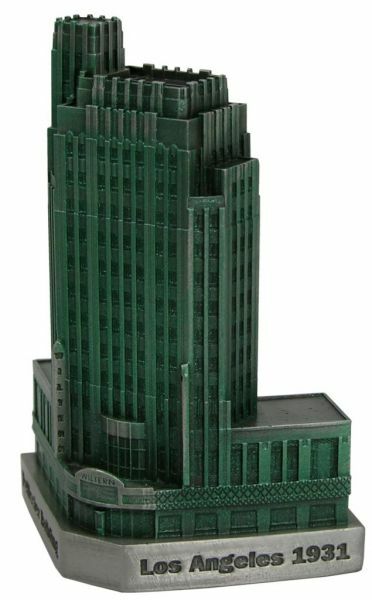 The Pellissier Building is located at 3780 Wilshire Blvd in Los Angeles and was completed in 1931. This building was designed by Levin & Associates Architects and Morgan, Walls & Clements Architects and stands 155 feet tall with 12 floors. The famous Wiltern Theater is located at the base of the Pellissier (formerly known as Franklin Life Building). This pewter replica stands 4-1/4 inches tall and is finished in antique pewter with green translucent. This model's scale is 1 inch = 40 feet. Its hard to beat my favorite replicas I have. This model is pretty good.. Definitely worth the money and a great addition to any collection.